by Tim Darling (email) - June, 2008. After a trip my wife and I made to a Charles Schulz exhibit in April 2008, I started collecting and reading all of the early The Complete Peanuts books. 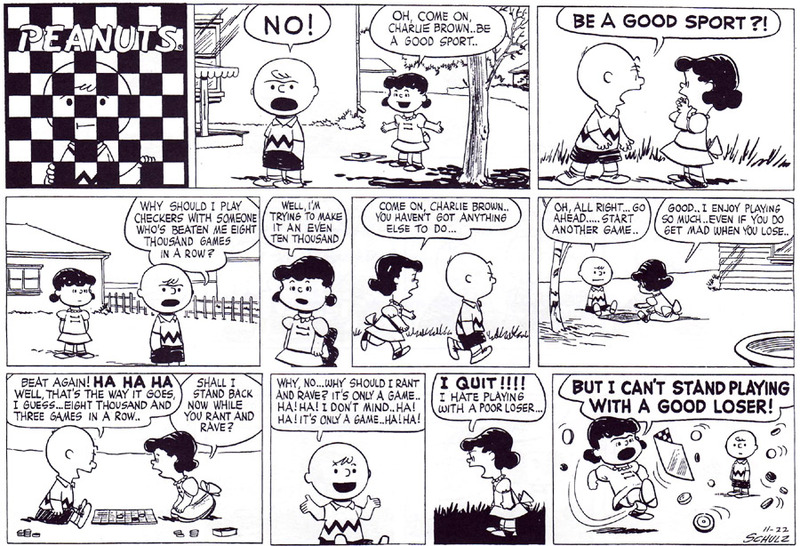 An item in the exhibit suggested that the central theme behind Peanuts was that of failure, such as Charlie Brown’s failure to ever learn how to fly a kite, beat Lucy in checkers, or win a baseball game. 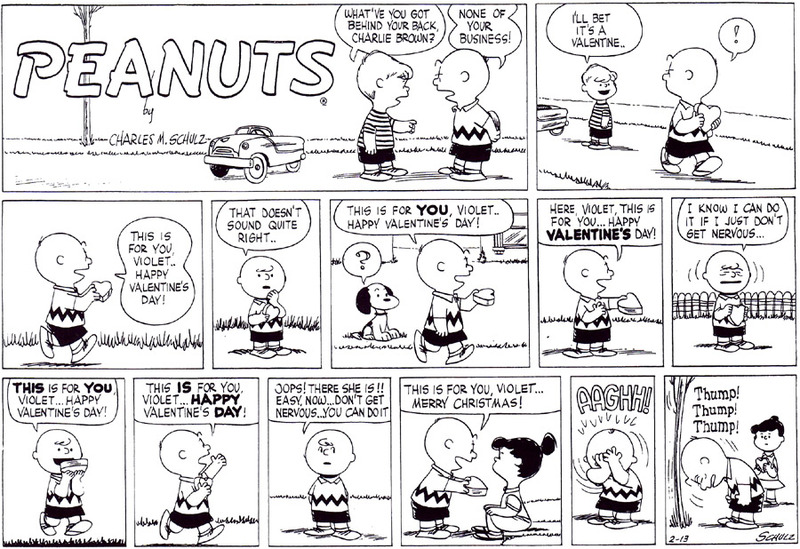 Failure and rejection are both prevalent in Peanuts, providing the foundation for many of the strips. Failure is the inability to perform a specific action and rejection is a specific kind of failure: it’s the acknowledgement by others of one’s failure to fit in in a social group. Of course, on the surface, none of the characters in Peanuts seem to fit in. Snoopy is constantly daydreaming about being someone or something else, such as a WWI ace fighting the Red Baron. Linus is constantly tied to his blanket. Pig Pen is always covered in dirt. 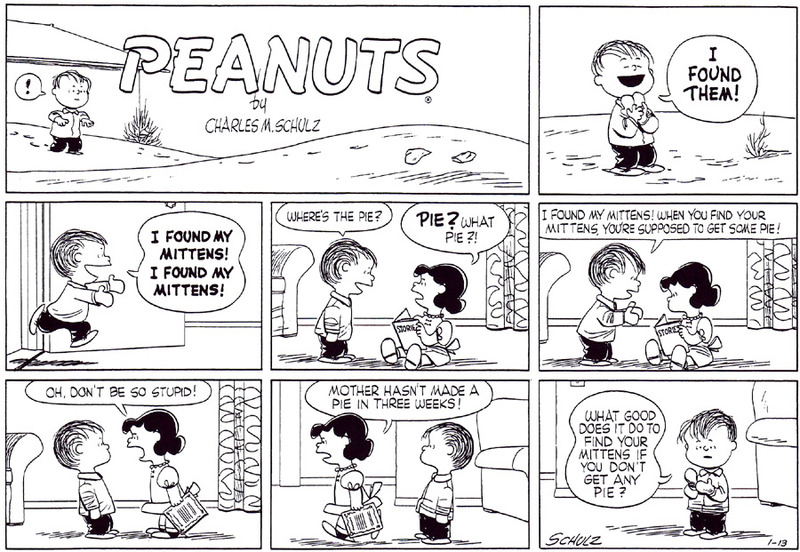 Marcie inaccurately refers to her friend Peppermint Patty as “Sir” out of misplaced respect. 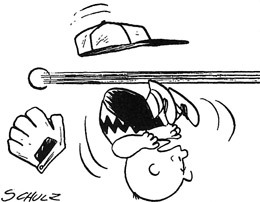 Still, Charlie Brown receives the lion’s share of the rejection – and most of it comes from Lucy – perhaps because he’s so consumed with trying to find someone to trust; she takes advantage of this by literally (and figuratively) pulling the football out from under his foot. 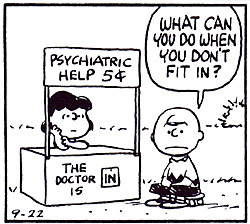 Charlie Brown silently endures most of Lucy’s insults. 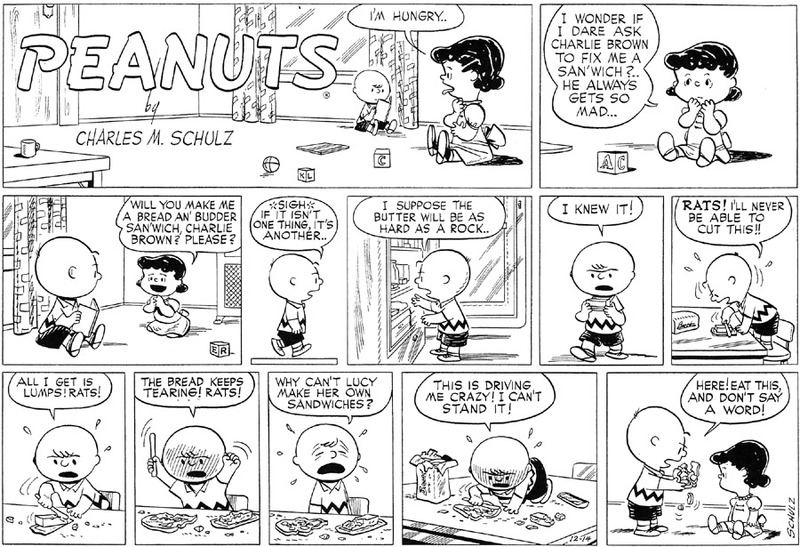 Schulz’s imaginary world was based on the people and situations from his own. In 1982, Laurie Colwin asked him if someone who was following the strip from the beginning could “actually write a biographical portrait of you?” Schulz answered, “I think so. 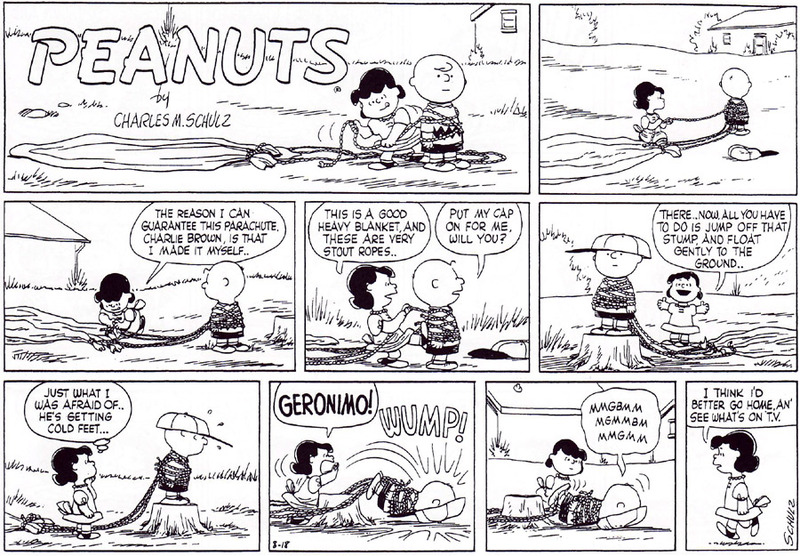 You’d have to be pretty bright, I suppose.” In junior high, Sparky (Schulz’s preferred lifelong nickname) played for and managed his neigborhood baseball team; like Charlie Brown, he also purportedly could not sleep on nights before a game. (Although unlike his protégé’s team, Sparky’s often won.) His childhood dog was named Spike. His mother said to him before she died, “If we ever have another dog, I think we should name him Snoopy.” The 1965 and 1973 Peanuts sequences showing Charlie Brown being “drafted” to summer camp echo Sparky’s own time as a GI in WWII at Camp Campbell and in Europe. And in the strip, Snoopy’s cousin, Spike, lives in a lonely desert that closely resembles the “120° in the shade” town of Needles, California where Sparky and his family moved for a couple of years when he was 9.1 Schulz cared about Charlie Brown, Linus, Lucy, Snoopy, and the others like they were parts of himself and his life and the connection goes far beyond these fairly superficial similarities; he never used them as tools for easy gags. His mother, who died of cancer just days before he was drafted and shipped off to Europe in WWII, cared very much about her only child. But she believed that the world would ultimately defeat him - or anyone - who was sensitive and dared to dream big, as he did with his hopes of becoming a world-famous comic strip artist. He later summarized her belief, “You don’t want to put your head up too high, because then you could be shot down.”3 Having big dreams makes you threatening to others. Charlie Brown is the charicature of this. He has a physically big head along with his high hopes and relative intelligence - and he is constantly being shot down by those around him. 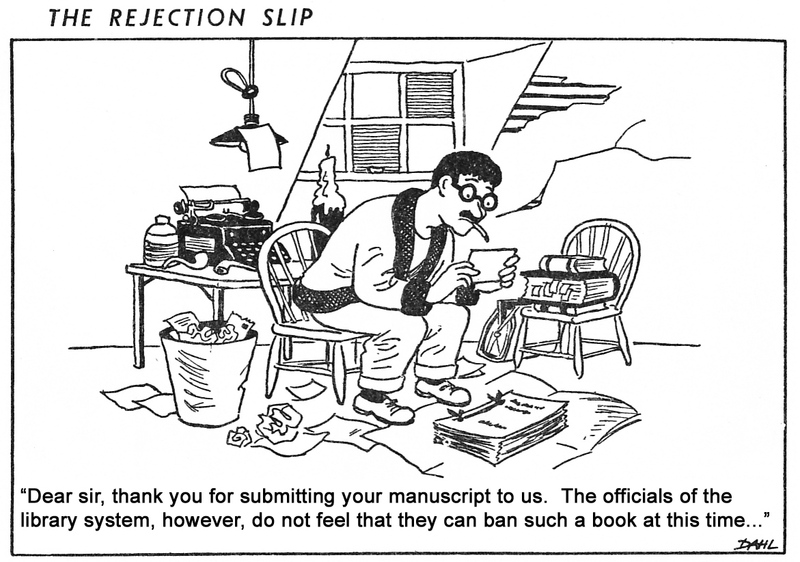 Beyond Peanuts, why are failure and rejection important topics to discuss? Failure is a chance to learn from our mistakes. 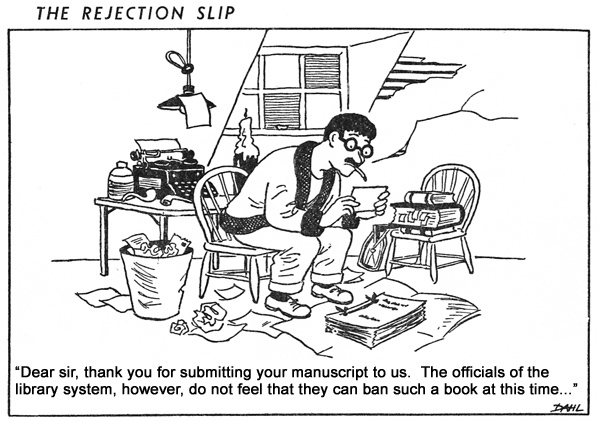 Rejection is a chance to galvanize what’s important to us as individuals and consider how to best carve a place for ourselves in society. And both are chances to fine-tune our sense of humor. The fear of possible failure or rejection sometimes prevents us from trying new things or meeting new people. In the world of Peanuts, the characters may not always handle failure or rejection effectively and they may overly dwell on the negative aspects, but at least they never seem to let their fears inhibit them. 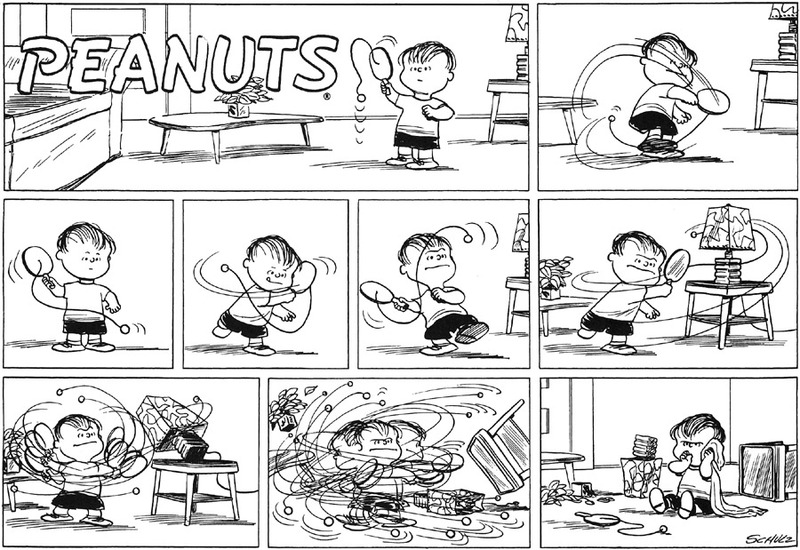 The comic strips are organized by the characters reacting (or sometimes pre-emptively acting) constructively or non-constructively. Constructive reactions include taking in feedback, re-evaluating the situation, and making necessary corrections before trying again. Non-constructive reactions include making excuses, blaming yourself or others, giving up, or trying the same thing over and over again without taking steps to allow for a different conclusion. When faced with the possibility of failure, sometimes we try to change ourselves, sometimes we try to change the people or environment around us, and sometimes we don’t try to change anything. Of the first two options, it is not always clear which is more constructive. In cases of rejection by others, to change yourself to match those around you may be the wrong choice as peers are often imperfect and have superficial intentions. Still in Pig Pen’s case, for example, it’s hard to argue that by not bathing he is expressing his personality in a meaningful way. In cases of failure, changing yourself to adapt to an immutable world may be a constructive step, such as by learning that gravity always acts in the same way, despite what you do. Trying to change the world around you if you believe you are right and everything or everyone else is wrong is a difficult, even if noble, goal. Such a state of mind may be the foundation for all change though. George Bernard Shaw famously said: “The reasonable man adapts himself to the world; the unreasonable man persists in trying to adapt the world to himself. Therefore all progress depends on the unreasonable man.” Charlie Brown may be the quintessential role model for all aspiring “unreasonable men”. I love this page. :] To whomever made this, thank you! All text copyright © 2008 Tim Darling; all images © 2004 United Feature Syndicate. You can find The Complete Peanuts (50 years’ worth of comic strips in 25 volumes published from 2004 to 2016) at amazon.com and elsewhere. The article discusses the strip in a critical manner and the images are used to support the main points of the article.